The 9 Best Apple Orchards in Arizona! Arizona may not be the first state that comes to mind when you thinking of lush apple orchards, but you’re in for a treat. Throughout the state, you’ll find a variety of orchards offering the freshest apples of all your favorite varieties. All sides of Arizona are home to some prime orchards to pick up some fresh fruit. So what are you waiting for? Here are the best apple orchards in the state. People come near and far to take a visit to Apple Annie’s Orchard. This has been the go-to apple picking spot in Arizona since the orchard was opened to the public in 1986. Located in the Sulphur Springs Valley, Apple Annie’s is home to ideal harvest weather for apples. There’s no shortage of trees to pick from on a trip to the orchard. Apple Annie’s features 10 apple varieties in addition to family friendly events and activities. One tip—you won’t want to miss their signature apple pie. You don’t have to just get apples at Schnepf Farms. This East Valley farm is home to plentiful u-pick gardens that include a variety of fruits and vegetables. Their most famous export, however, is peaches. Schnepf Farms is the largest organic peach grower in the entire state of Arizona. Their u-pick gardens are open every Thursday through Sunday and admission is free. Apples and other fruits are typically available in the early summer. Willcox has stiff competition when it comes to apples. Apple Annie’s may be the household name, but there’s another fantastic Willcox apple orchard: Briggs & Eggers. This 400-acre orchard has been a purveyor of fine apples since 1968. It’s also located in an ideal harvest environment, meaning there’s no shortage of juicy organic apples available. You can get your apple fix by taking a trip to their storage facility that’s adjacent to the orchard. No, not that Fenway Park. Fenway Park Orchard, located in Morristown, is home to over 1,000 fruit trees. This orchard has been providing delicious, juicy apples to Arizona residents for over 45 years. Fenway is a pesticide-free, organic orchard. They specialize in Anna and Golden Dorset apples, in addition to their large selection of peaches. Date Creek Ranch is synonymous with two things: grass-fed beef and apple picking. This family-owned and operated cattle ranch is a favorite among apple pickers for its ultimate “ranch style” experience. Apple picking season runs from September through October. 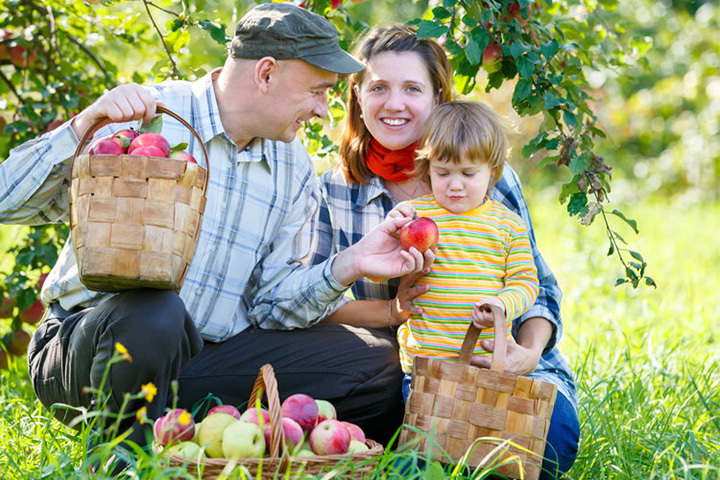 You can wander through the orchard with bags or even a wheelbarrow as you pick your favorite Golden Delicious apples. As a bonus, you’ll also get up close to some livestock and even get the chance to buy some apple pie. You don’t have to go to a farm to experience apple picking. Pendley Homestead, located in Slide Rock State Park, is a great place to do some picking the old-fashioned way. The Pendley Homestead was a large apple orchard in the 20th century before being sold in the 1980s. The old orchard and its grounds can still be seen today. You can spend a day searching for some of the 13 varieties of apples that still grow on this site. Howard’s Orchard is like a slice of apple pie. It always leaves you wanting more. This Tucson orchard is home to hundreds of tomato plants, peach trees, apple trees and more. Visitors come from near and far to get a taste of the rich fruit. Apple season is also in August in contrast to many other orchard’s schedules. It’s open Wednesday through Saturday mornings. Looking for apples in Southeast Arizona? Look no further than Beatty’s Guest Ranch and Orchard. It’s located in a basin between two peaks. The unique location creates an ideal situation for apple growing. At one point, Beatty’s was home to 1,300 trees and 34 apple varieties. Unfortunately, many of the trees perished in a fire in 2011. Today, this orchard is rebounding steadily and has more than enough options for hungry southern Arizonans. Mother Nature’s Farm has been a Valley staple since 1968. But it wasn’t until the late 1980s that Mother Nature’s Farm became known for their pumpkin patch. The patch helps them attract thousands with a fall festival every year. During the summer, however, Mother Nature is all about apples. Their Gilbert farm location is home to u-pick peaches and apples during May and June.